Junk King is great at problem solving. They want to make sure that all the items you want to get taken away can be efficiently load it onto their truck. Sometimes that might take additional crew and trucks to get the job done. That is especially case with major cleanups like a foreclosure or hoarding situation. 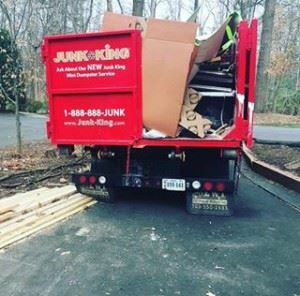 You might not even have to ask for that additional labor; Junk King will provided automatically. Junk King bases its fees on volume. It all comes down to how much space your stuff will fill up on the back of the truck. When you’re not charged by the pound for junk hauling, then there’s no limit to what you can get rid of. Imagine what a big difference that will make around your house. Once the Junk King crew start their day, they stay busy. However, there still at the mercy of Chicago traffic. That’s why they want to stay in touch with you so that you know exactly what is going on and can be ready for their arrival. It’s a smart move to hire Junk King Chicago for any junk hauling task. This entry was posted in Chicago Junk Removal and tagged Junk King, junk removal, reviews on September 25, 2017 by Junk King. Last updated September 25, 2017 .